A perfect cloud floating by; its message unclear as it drifts up in the sky. A calm wind contemplates life’s whims. The rustle of wind in the trees – A kaleidoscope of color; then a feeling like no other: A lightness is sensed deep inside, as another summer day travels by. Be kind, find moderation, compliment a friend or love one and above all enjoy the weekend! Sigmund Freud talked about the ego as part of the psyche that consciously governs the Id, a source of instinctual energy. We often become so entrenched and buried in control patterns (hard-wired behaviors and emotions), that we lose control of our egos. As society molds us, for better or worse, two people emerge from one human. Jekyll and Hyde are a famous literary example of this psychological phenomenon. 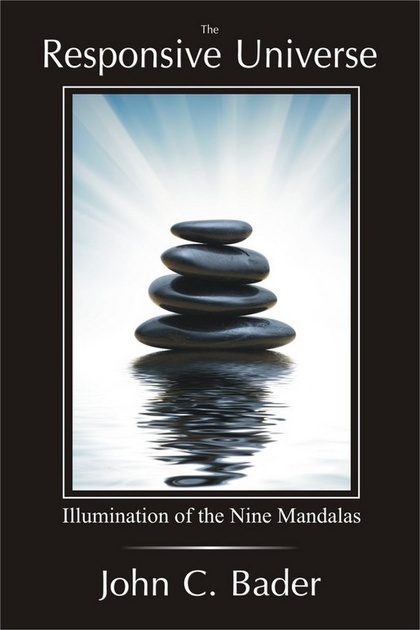 As I have written before (in The Responsive Universe), two forces of empowerment determine our behavior and life paths—one sees reality as a true reality which is tied to our True Nature and the other sees a reality laden with layer upon layer of outside influences, masking and clouding our True Nature. The latter force creates an ego that, if unchecked, fosters negative self-esteem. The ego itself, whether good or bad, thrives on ideals, beliefs and laws that determine a perception of the world and life that is larger than the individual. It becomes the governing force from which we unknowingly base our daily actions. 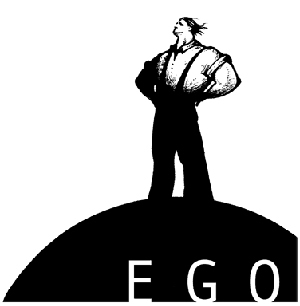 The ego is born in childhood, and often on the road toward adolescence, it develops bad habits. As a child, the ideals and beliefs that make up that realm beyond us come from others. Nothing is more important than having other peers around who approve of you and what you wear and how you look and speak. We then frame our belief system around this need to be accepted. We carry this pattern with us into adulthood. Have you ever heard the term “keeping up with the Jones’? There is this invisible benchmark that is positioned at unreachable levels. Our role models are celebrities and sports athletes that tend to set the bar so high that as ordinary people, we are set up for failure. Fashion magazines and television programs show us how to look and behave. And, then there is the hypothetical Jones family who lives down the street and the pressure of keeping up with their attractive lifestyle. How many times have you sat at a stop light and watched the person next to you preen in his or her luxury automobile, basking in the attention you are apparently directing his or her way? What was once a childhood control pattern—being the coolest kid in the eyes of your peers—becomes an unconscious habit later in life. We become ego feeding junkies, so entrenched in what other people see and think, we lose sight of the true being that exists stifled under these false layers of confidence. The ego becomes a runaway train that can only be stopped when you start thinking for yourself and redefine that realm beyond you that determines your self-esteem and subsequent actions. Once we do this, we achieve the first step to self-actualization. So, how do we confront our egos? Well, you already have taken the first step by simply being aware that you have an ego and it may be in possession of your true nature. Start attaining more clarity in your daily life by being more conscious of your actions. You need to ask yourself where the source of this root action lies. Are you making the choices based on other people’s approval, self gratification or are you making decisions and actions based on unadulterated motives – unselfish and unfettered? By being more aware of the root of our actions and control patterns you will begin to take power from the ego and slowly begin moving toward the power of your True Nature. This is the true progression of a self-evolving human – less ego and false-self and more pure, unfettered actions and reactions rooted in positive energy. Manifest Destiny – Part VIII. Manifest Destiny – Part VII. I was sad to see Sedona go in my rearview mirror. I feel as if there was an amplified energy that continued to build the longer I stayed within its red rock reaches. I felt some amazing feelings of energy akin to the beauty that is Sedona but it was the lack of energy entering New Mexico that was more perplexing. I visited the City of Gallup, just across the New Mexico border from Arizona. My Wife and I wanted to search for reasonably priced turquoise jewelry. My Grandfather, an old cowboy familiar with these parts said we should search the trading post/pawn shops that dot the border. The prices were through the roof despite a slumping economy, and disappointed, we did not purchase anything. I drove out of Gallup with a cold negative energy that seem to float over the dusty streets. It seemed as though all the local Indians were pawning their family heirlooms to make ends meet. The poor neighborhoods that dotted the landscape east were a grim reminder of how depressed west New Mexico really is. I felt sad for the Native American people that call this region their home. I felt a negative energy from people and the surroundings and was happy to leave for Albuquerque. All I can say is my heart goes out for these people. I think they need and deserve our compassion even if they greet tourists such as me with cold, indigent stares – not to mention, negative energy. I know Native Americans are very spiritual people and unfortunately they are victims to the social/political climate here in the US. 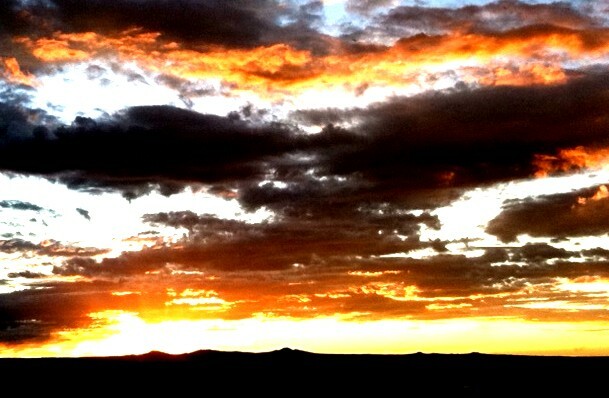 Still, the day was not a complete bust: Once in Albuquerque, I was greeted with an amazing sunset. I sort of consider myself a sunset connoisseur. I especially love tropical sunsets as the sun sets over the ocean. Still, here in Albuquerque, with the sun setting over the desert mesa, this moment (as shown below) is hard to beat. Sunsets can bring so much energy to just an ordinary vista. One does not need scenic mountain peaks or red rock canyons when the perfect painting of clouds and refracting light can make any moment at dusk extra special. This was a special sunset and I will post this journal now and continue to enjoy the afterglow that greets the night in New Mexico. Tomorrow, the panhandle of Texas and then Oklahoma City as I grind my way home back to Illinois. Between you, me, and the cactus out here in New Mexico, I am ready to come home! Manifest Destiny – Part VI. After reaching the ocean on my trip to Manifest Destiny, my travels now loop back to the Southwest deserts. 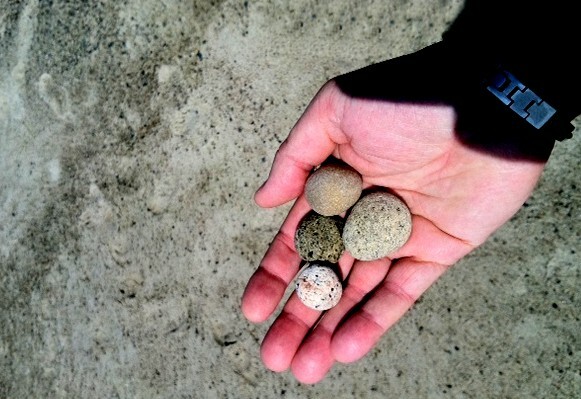 I traversed the brutal Mojave Desert from California to Arizona, where I experienced 115 degree temperatures. 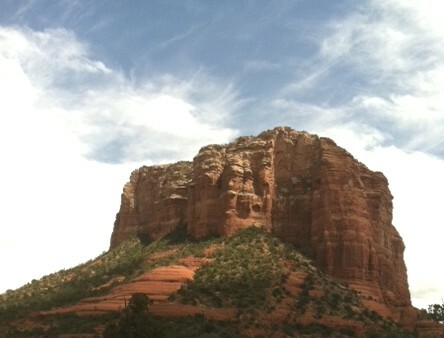 My journey across America in search of Energy Vortexes now takes me to Sedona, AZ. Sedona is famous for its spiritual and meditative powers; a power or energy that seems to transcend all religion and faiths. An Energy Vortex is a unique place that exhibits subtle levels of swirling energy that some say actually permeates from the red rocks and outcroppings surrounding Sedona and Oak Creek. During my adventures in Colorado, I confirmed that the more picturesque and scenic a site is the more energy it seems to permeate. The Maroon Bells near Aspen, Co. are a perfect example. Still Sedona is a little different. One can always find higher levels of energy in natural places of beauty. Energy can be found in trees, mountains and even people. Yet, here in Sedona, there is a dynamism that takes the concept of energy to an entirely different level. It is even a viable business as paid guides lead tourists to the different Vortex points around the region. 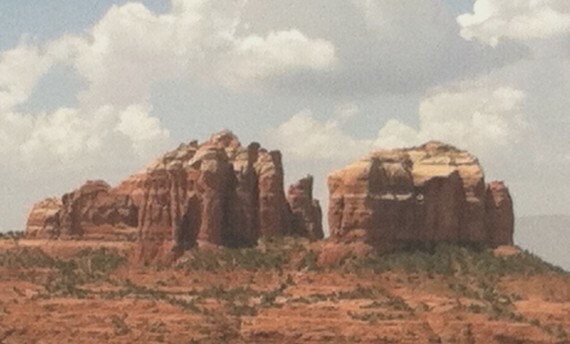 I experienced three individual Energy Vortexes while visiting Sedona and its outlying areas. The first stop was the “Airport Vortex”. This particular Vortex can be found close to town, off of 89A on Airport Road. The Airport Vortex features a chasm saddle shaped mesa which is surrounded by many canyon walls and rusty rims. I hiked up a trail that lead to a lookout that provided inspiring views. The key is to look for special Juniper trees which dot the hills sides. Most Juniper trees are normal looking as their branches and trunks reach straight for the sky above. Still, if you are mindful of your surroundings, look for the occasional twisted and gnarled variation that indicates there is a higher level of energy present. It was my Wife that actually found the perfect spot: The trunk and branches of this specific Juniper where twisted and tormented as if there was a mysterious force at work. It was here with Canyon views in all directions that one could feel a change in the environment: An uplifting feeling that welled up from within. The next stop was the Chapel of the Holy Cross, a beautiful stone Catholic Church nestled into the red rock canyon walls overlooking the “Cathedral Rock” Vortex (off of Chapel Road). The Church was beautiful as was its immediate surroundings: The canyon walls displayed textures and faces that look like they had stories to tell. The Cathedral Rock Vortex looked like a monument built by God sitting alone on a desert floor. It’s towers of red rock and spires where magnificent. At the time, there was a lone thunderhead sitting directly above the edifice. 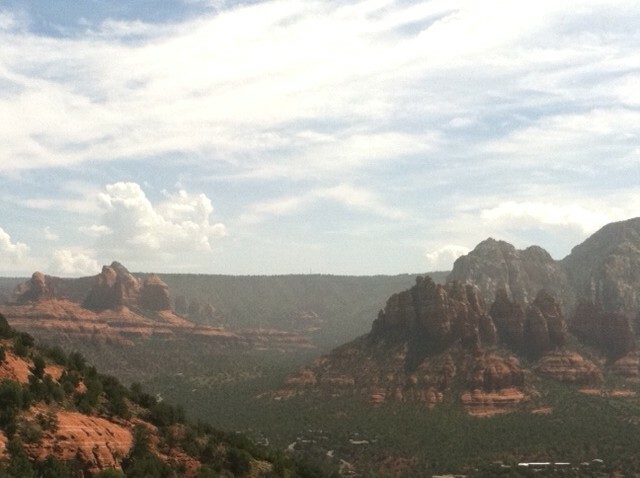 The clouds here in Sedona are interesting: They tend to swirl and make odd shapes that seem indigenous to this region. 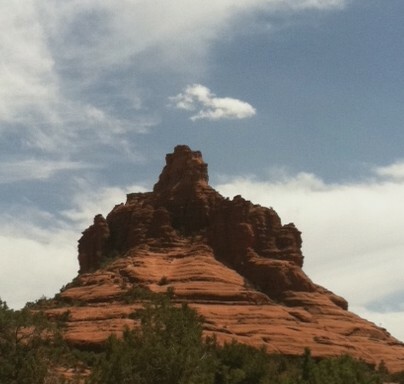 The “Bell Rock” Vortex is considered the most famous and powerful of the sites here in Sedona. It is here I took several hours to climb its red features and actually meditate for 45 minutes in a special spot near a twisted and tangled Juniper tree. Bell Rock is located off of HWY 179, just North of the Oak Creek Village. I was exhausted and a bit cranky after driving 500 miles the day before through scorching heat. I also have a wicked blister on my foot the size of a quarter (thanks to hiking in California) that makes walking and climbing painful and challenging. Yet, as I hiked to the mid section of Bell Rock, there was a noticeable energy transformation: I was enveloped with a complete attitude adjustment and my pain and sore muscles were washed away. It was clear there are healing properties at work at Bell Rock. There was a point at the top of my climb that I had the entire monument to myself – my meditation was peaceful and inspiring. During my meditation session a large thunder-storm began oscillating to the west. Its distant thunder almost seemed like a warning that this is as close to heaven mortals are allowed to travel. 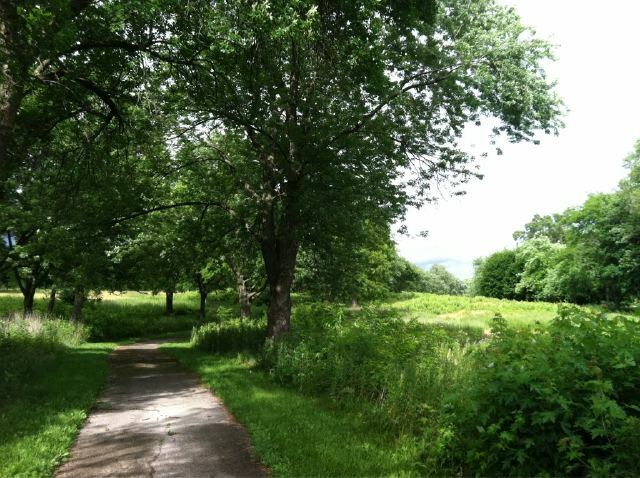 Almost immediately, the stifling 99 degree air dropped to the upper 70s – goose bumps materialized on my skin and a shiver rolled through my body. At one point, I laid on my back and watched the clouds swirl above the Bell Rock peak – much like Maroon Bells, there was this visual evidence that high levels of energy were present. It was enough to feel its healing qualities, but there is also tangible evidence of energy as well. I have to be honest now. I have traveled over 2800 miles in search of natural sources of energy – It is my opinion that all places of beauty hold higher levels of energy and lets face it, beauty is in the eye of the beholder. I have worked hard over the years to be spiritually mindful of my interior qualities as well as my surroundings. I have a clarity and responsiveness to life that has taken years to craft. I feel the energy here in Sedona and there is no doubt this is a special place. From a scenic standpoint, it is a 10 in my book. Still, I felt similar energy rushes in Colorado and even in my back yard at home. My honesty disappoints me in the fact that I was hoping to come to Sedona and find something magnificent. I did find inspiration and peace, but that is intrinsic to my being. Maybe the beauty and energy is all inside us and certain places like Sedona or Maroon Bells helps facilitate a better medium to connect to such energies? My wife brought up a good point: Annamarie stated that maybe such places like Sedona require more effort? It might take 5 individual hikes up to Bell Rock to slowly preen the energies present – and maybe each experience will be different: The gift may be the combined experiences over years of appreciation. I can tell you that this will not be my last trip to Sedona. Up next, New Mexico as I meditate across America. There is more to come later this week as I begin my long drive home. “The Court House”: This edifice sits next to Bell Rock and is amazing to behold. “Airport Vortex”: There were a lot of gnarled trees in this area – definitely a lot of energy! “Cathedral Rock Vortex”: One of the more stunning rock formations in Sedona. There was a unique looking thunder head that was sitting right over the formation. There were no clouds anywhere else in the sky at the time. 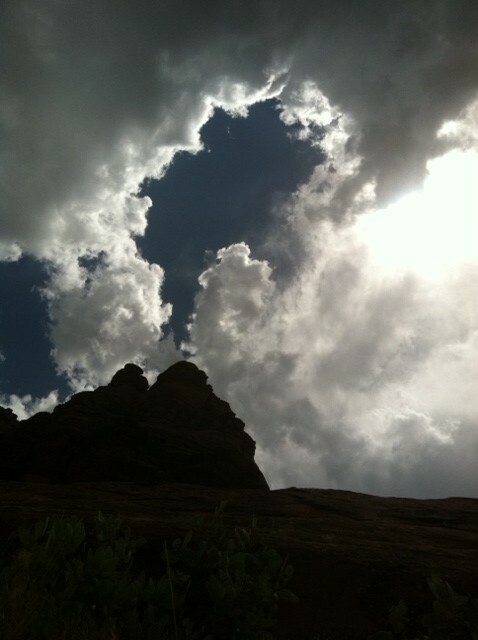 “Bell Rock Vortex”: After hiking midway up, I took this image laying on my back looking up at the peak of Bell Rock. The clouds actually appeared to be vortexing around its apex. “Bell Rock Vortex”: Known to be one of the more powerful Vortexes in Sedona.